This is a game I made for my Java mini-project in college. You'll need to have java installed in your computer to be able to play it. It's a very basic match three game with no juicy elements but I like it. 1. Download and install java in your computer. 2. Open the command prompt and navigate to the directory you placed your download files in (using the 'cd' command). 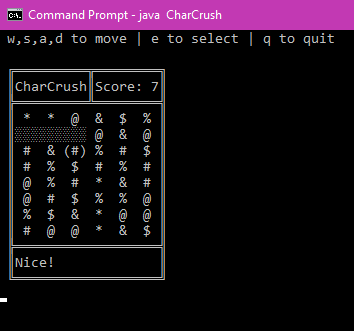 3. type 'java CharCrush' to start the game.